1. Holding the baby, pull the ingredients out of the fridge. Be sure to squat instead of bend over to keep baby from falling out of your arms and to get a little boost in your core. 2. Stepping around the sniffing dog, set all food ingredients on counter for Chris to make smoothie. 3. Pull paring knife from drawer with mostly-awake hands. 4. Drop knife onto wood floor. Important: react quickly and jump out of the way as it clatters to the floor, hitting nothing but the wood. Thank your lucky stars that the baby is in your arms and the dog was out of the way. 5. Squat again to pick up the knife. Put knife on cutting block and walk away. 6. Chris should now start to make the smoothie. Cut into the cucumber and notice that there is the tiny metal point of the knife is missing. 7. Check the bottom of all feet (except the baby’s). 8. Run super-strong magnet over the floor, including the crunchy under-counter corners. Come up with only food crumbs. Chris and baby should now retreat to the baby-proofed part of the house. 10. Put dog in his crate. Ignore his whining and yelping while you sweep carefully the entire kitchen and eating area. Once swept, use wet mop over the same floor area. Notice that the wet mop’s scent is called “Open Window Scent” in English, and “Parfum GRAND Air” in French. 11. Finish cleaning the floor. Chris should set baby down in living room to do another sweep. 12. Jennifer should put ingredients into blender in the order listed above. 13. Baby should find dog’s water bowl, tip it over, and splash happily in the water. Baby should not finish until his lower half is entirely soaked and he is grinning and clapping his hands. 14. Chris should clean up the water, undress and re-clothe the baby, who should screech in protest. 15. Jennifer should finish putting ingredients into blender, but wait to start blender until baby is reclothed and in arms, because the sound scares him. 16. In the meantime, Jennifer should wash the rice maker bowl soaking in the sink from last night and put away dishes in the drying rack. 17. Dog should settle and accept his crated state. 18. Once baby is in arms, run blender. Notice that, despite it being a fancy super-blender, the apple quarters are sticking in the blade and not blending. 19. Use blender wand to push apple chunks into the blades. Keep using the wand. Turn off blender, remove from base, shake to loosen. Add more almond milk. Blend again. 20. Notice that smoothie is getting warm and frothy because of blade action. Add more frozen peach slices. 21. Apple chunks should now loosen and blend. 22. Once mostly smooth, pour into two glasses. 23. Hear plop in the bathroom. Parents, wonder if you engaged the childproof lock on the toilet the last time you used it. Realize that you probably didn’t. 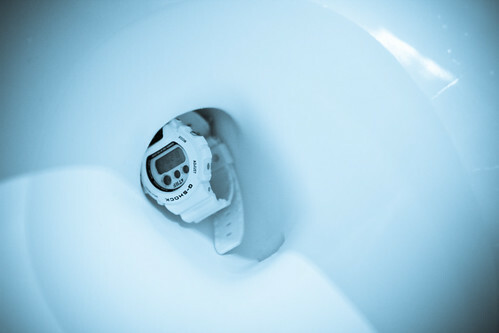 Rush in and find Chris’s G-shock watch (waterproof!) in the toilet. Thank your lucky stars that you did not let it mellow last time the toilet was used. 24. Take picture of first item dropped in toilet. 25. Remove and clean watch with hot water and soap. Wash baby’s hands. Wash your hands. 26. At last, put baby in highchair, feed rice crackers and salmon. Parents, drink now-lukewarm smoothies.